When it comes to important economic programs, most people wouldn’t put child care at the top of their list, but that’s starting to change. We’ve known for years that quality child care programs can return more than $2 in benefits for every $1 invested, primarily as a result of better socio-economic outcomes for children. Other analysis has shown that child care and early learning programs produce strong job creation and economic stimulus. One billion dollars invested in child care creates an estimated 30,000+ jobs, compared to just 3,000 jobs for $1 billion in corporate tax cuts. More recent analysis shows public investment in a universal affordable quality child care program can more than pay for itself. 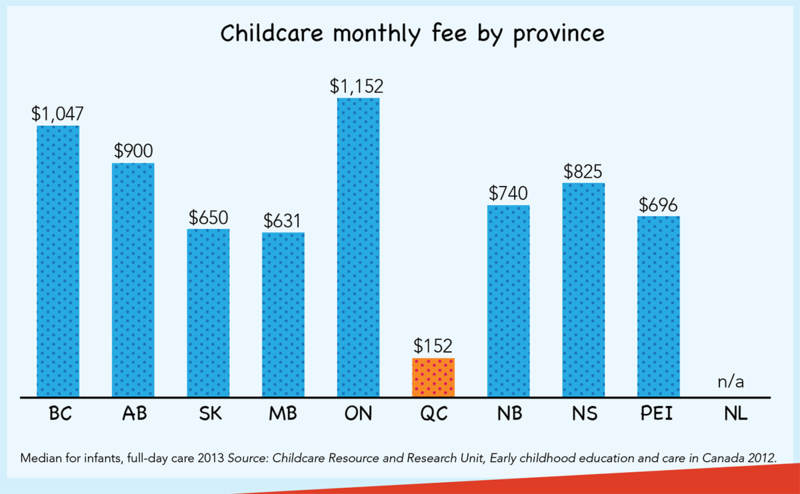 Analysis by one of Canada’s top economists found that for every dollar the Quebec government spent on its $7-per-day child care program, it gained $1.05 and the federal government gained an additional $0.44. These benefits came from increased tax revenues because parents and child care workers were employed, and from lower spending on tax expenditures and social programs. Women aged 25 to 54 are eight to ten per cent less likely to be employed outside the home than men in the same age range. Many would like to return to their careers but find it’s just not worth the high cost of child care. By providing greater opportunities to lower and middle income families, quality public child care helps reduce inequality while providing an important economic benefit.